When taking on a job at home or work, big or small it is often the case that the most time consuming part is the preparation. Added to which, it is often the most tedious and labor-intensive part and can often result in a lot of procrastination, many excuses and ultimately the job not being started! We’ve all been there, with busy lives and many pulls on your time, those DIY jobs are often at the bottom of the to do list for months (if not years!) at a time. At Owatrol, we like to do what we can to ease your workload and our range of surface preparation products should do just that. Whether it’s saving time and elbow grease, or helping to provide a more professional and better quality overall finish, there’s bound to be an Owatrol solution for you. In this handy guide we’re hoping to take away the mystery surrounding some of our products and explain exactly what they can do for you. Easy Surface Prep (ESP) is our easy to use preparation which allows you to use oil or water-based paint or finish on any shiny or non-porous surface without the extremely laborious and time consuming job of stripping and sanding first – what a relief! What’s more, it’s so easy to use we’re pretty sure you could even do it in your sleep. You can use it directly from the bottle and simply wipe it on with a cloth, brush or roller. 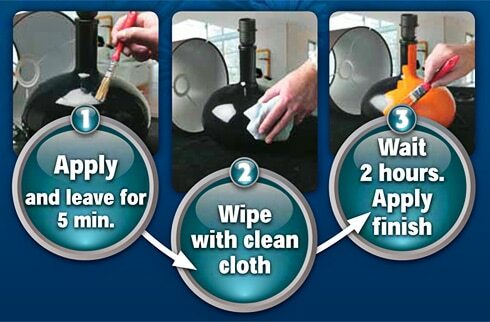 Once it’s applied simply leave it for 5 minutes before wiping off any excess product. Next, put your feet up for 2 hours to allow it to fully dry and then voila – ready to paint on shiny surfaces in your choice of finish any time for the next week. Don’t worry, if you don’t get around to painting it within the week, just repeat the simple process. Repaint your kitchen cupboard and drawer fronts for a fresh new look in the kitchen without breaking the bank – and without the hassle of stripping and sanding first this becomes a very manageable task. Team it with perhaps some new kitchen linen or a new blind for a brand new look in very little time. Paint your bathroom tiles – you know the ones you have been putting up with since you moved in because re-tiling the bathroom is just that little bit too expensive. Well with ESP it’s as easy as wipe on, wipe off and paint! How about all that flat pack melamine furniture that seemed a great idea to buy in bright pink when your daughter was 5 – but at 11 now she’s just not feeling it any more! Refurnishing an entire child’s bedroom can get pretty costly, why not try a lick of paint instead? You could even get the kids involved! That uber expensive designer lamp your other half persuaded you was entirely necessary for the lounge in neon green – but now you’ve moved swiftly onto a teal and brown color scheme it’s looking a little out of place? and what about that pistachio bathroom suite…need we even say more? 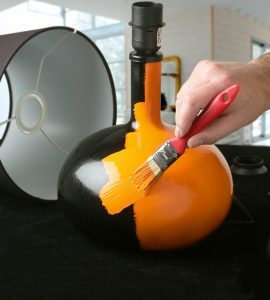 Improve the flow of your paint and avoid brush marks for a more professional finish. Our paint additive Easy Flow is one of the decorating industry’s well-kept secrets but there’s absolutely no reason why you can’t achieve great results with it at home. It is a paint additive suitable for use in all water-based paints which improves the flow of the paint, allowing you to paint more easily and with better flow. As a result, you will notice far fewer brush marks and a much improved quality of finish – even from the most novice of painters! We know that the mere thought of paint additives and other “complications” can have some home DIY-ers running a mile but we’d like to reassure you that it really is very simple to use and the impressive results are definitely worth it. 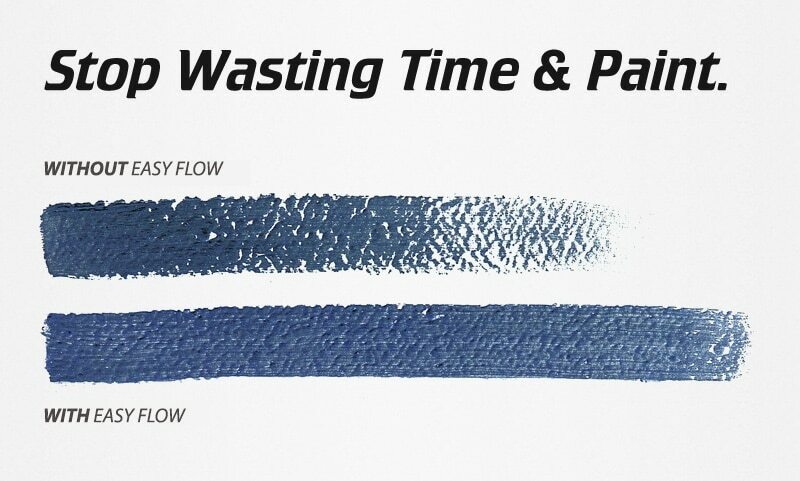 To use Easy Flow in your paint you simply add it in the recommended quantity (please see the packaging or product information page on our website for specifics about concentration for your particular needs) and ensure it is well mixed in. Then simply paint as you normally would, safe in the knowledge that Easy Flow does not affect the inherent qualities of the paint. It should definitely become a staple product on the paint shelf in your garage and you won’t regret giving it a try. It’s especially useful for those more difficult jobs like painting ceilings – by using Easy Flow in your paint you will find that the roller glides much more easily across a ceiling and won’t drag or begin to dry too quickly. Please note that Floetrol is for use in water-based paints only, if you are looking for a similar effect in oil-based paints then simply use Owatrol Oil instead. With Owatrol’s Easy-Bond you have a bonding primer and first coat of paint in one. Owatrol’s Easy-Bond is perfect for use on porous or powdery surfaces (such as new plaster) and provides an excellent bonding primer and first coat of paint in one. It is another paint additive suitable for use in water-based paints which eliminates the need to prime separately with mist coats or a separate primer – saving you heaps of time! Easy-Bond is highly penetrative and acts as a stabilizer, penetrating deep into the surface to firmly bond the first coat of paint to the substrate, thus eliminating the need for a primer. It ensures an even coverage of the first coat and maximum adhesion between the first and second coats. It helps to alleviate the peeling and flaking problems that can often occur. It can also help to alleviate problems with paint peeling caused by damp. By mixing Easy-Bond into the paint before applying it to the damp affected area, the paint is much more likely to adhere and any peeling problems will be reduced. We treated a persistent damp problem in the Victorian front porch with Owatrol’s Easy-Bond bonding primer- 12 months later there is only a very small recurrence so we are now preparing for a top-up treatment having brought the problem largely under control- thanks to Owatrol! When thinking about surface preparation, just remember that elbow grease is not always the way forward, with our Owatrol solutions you can make life much easier for yourself.